to remain below a certain statistical probability of incurring that risk. It is claimed that the consequent economical burden is transferred both ways in the economy: downwards, affecting the price of re­sources that are perceived to be more or less clean, and upwards, increasing the price of products seen as less environmentally friendly. The fallacy of this assertion may be exposed by considering that will­ingness to pay and the attitude toward a sustainable resource exploitation are different in different countries and may well vary in time. Therefore, in reality, the disturbances caused by a local modifica­tion in the environmental regulations affect regions possibly far away from the point of origin, and the method actually promotes an unfair transfer of not only the pollution but also the health risks from a region to another. A solution to this situation has been sought by linking the monetary structure of the environmental levies to energetic considerations: This is the rationale behind pollution commodity trading and the exergy tax. These are remedial measures, aimed at a fairer redistribution of the environmental pressure on a global scale, and they do not address the issue of how high the actual environmental cost is (all methods use the currently regulated values as a basis for their calculations). effluents for which some of the chemical decomposi­tion reactions take place spontaneously, in a short time and in the immediate surroundings of the emitting source. In such cases (Fig. 11C), the reac­tions must draw on some exergy source within the environment (a certain particular chemical catalyst, oxygen, water, solar radiation, or even a biological system), and this exergy flow must be accounted for as well. then the minimum exergetic expenditure will be proportional to the difference between the values of the physical exergies of the effluent stream between the point of its release and the regulated state point. 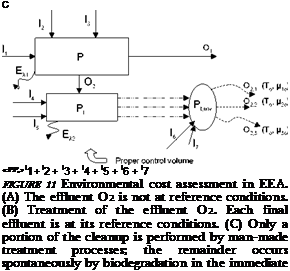 Here, we use one of the desirable features of environmental cost estimates and at the same time effectively avoid the considerable effort required to determine what the ‘‘tolerable environmental impact limit’’ for a certain pollutant would be. Once all fluxes (which can be equally regarded as production factors) have been computed in terms of exergy equivalents, EEA makes use of the same structured representation of TE to compute the costs of the final products and to study their dependence on a variation of process parameters. With all terms now expressed in terms of a uniform quantifier, the procedure is somewhat simpler and, more important, absolutely independent of external factors such as market fluctuations or time-varying currency ex­change levels. Current engineering practice uses a mixed energy – monetary formulation to study the cost-formation process of industrial products. TE represents a substantial improvement because its exergy-mone – tary procedures allow for an exact treatment of irreversibilities and for a better (more precise) accounting of the real causes of exergetic waste, which is equivalent to production cost (if we could find abundant amounts of a certain finished product in nature, its cost would be zero). EE, or EEA, broadens the objective and bases its treatment on a purely exergetic paradigm. TE is becoming increas­ingly popular, and modern production lines are designed according to its dictates. It is hoped that in the near future, EEA will constitute the basis for our cost-accounting procedure. When (and if) this occurs, we will be able to assess our industrial processes on performance indicators that correctly reflect the resource to final use (including disposal, in a omnicomprehensive cradle-to-grave approach) of our exergy resources. Ahern, J. E. (1980). ‘‘The Exergy Method of Energy Systems Analysis.’’ Wiley, New York. Baehr, H. D. (1962). ‘‘Thermodynamik. Eine Einfuhrung in die Grundlage und ihre technischen Anwendungen.’’ Springer – Verlag, Berlin. Bejan, A., Tsatsaronis, G., and Moran, M. J. (1996). ‘‘Thermal Design and Optimisation.’’ Wiley, New York. Bosnjakovic, F. (ed.). (1961). ‘‘Fachheft Exergie, Die praktische Bedeutung der Exergie,’’ Vol. 13, No. 11. Daly, H. (1996). ‘‘Beyond Growth: The Economics of Sustainable Development.’’ Beacon, Boston. El-Sayed, Y. (1998). A short course in thermoeconomics, Notes for summer school, Ovidius University, Constantza, Romania. Georgescu-Roegen, N. (1971). ‘‘The Entropy Law and the Economic Process.’’ Harvard Univ. Press, Cambridge, MA. Moran, M. J. (1982). ‘‘Availability Analysis: A Guide to Efficient Energy Use.’’ Prentice-Hall, Englewood Cliffs, NJ. Odum, H. T. (1971). ‘‘Environment, Power and Society.’’ Wiley, New York. Sciubba, E., and Wall, G. (2003). Exergy—A brief commented history. Int. J. Exergy.